I just finished up a day attending the Chicago RIApalooza event in, well, Chicago. First, I must say that I love cities with great mass transit systems. I’ve said this before and I keep threatening myself to move to one. For this event I paired up with a super designer Corrina Barber. Corrina works as a user experience designer at Microsoft, is wicked smart and was a perfect compliment to this event. Most of the attendees at RIApalooza I believed to be interactive developers, so most having a knack for design. I figured rather than a developer only session it would be better to have more of a design skew on what Silverlight, Visual Studio and Blend bring to the table for developers and designers. Corrina and I set off to demonstrate that designer/developer workflow that Microsoft talks about so much. To set the stage, basically we started with a concept and then Corrina used Expression Blend to create a wire-frame mock-up using unstyled controls. I then jumped in as the developer and modified only code, keeping the design in tact while my designer counterpart continued on fit-n-finish and polishing the design. It is really great to see this separation and see how a developer can work on a project, keep the design integrity 100% and allow this separation. In the end we had a final product that demonstrated this concept as well as some aspects with Silverlight such as IsolatedStorage, WebClient, LINQ to XML, data binding, etc. I hope it was well received. Corrina held court in the lounge afterwards gathering feedback from designers on what we (MSFT) are doing right with our tools/platform and what could be improved. I listened in a few times and it was great feedback and I think the attendees really appreciated hearing stuff straight from a designer! The rest of the day’s sessions were great. Back up. The night before was a social mixer where we had a discussion from Dave Meeker of Roundarch. This guy gets it. It really was spot-on in my opinion and I sincerely appreciated his perspectives and knowledge brought to the discussion that evening. We ended with a panel discussion that surprisingly had more to do with discussions around business/marketing aspects than any technology. It was a good discussion. Okay, the rest of the day was great. 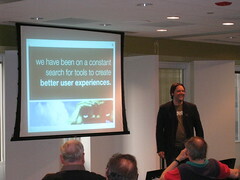 Presentations from Corey Miller and Anthony Hendley on Silverlight, WPF and XAML. A look at RIA best practices with Josh Holmes and Michael Labriola. Some cool framework stuff looking to merge the world of .NET and Flex from Ka Wai Cheung of We Are Mammoth (which ironically describes themselves as a small firm). I also personally had some great conversations, particularly with Stanton Ware, Donald Burnett and Michael Labriola. Nearing the end of the day I caught Michael in a resting moment and decided not to let him rest. What started with a simple question of “do you think you can show me Flex for a few minutes” led to an hour or so demonstration of Flex Builder, the platform and some concepts in software design of Flex applications. Honestly it was time very well spent and I have a much better perspective of Flex, what is good, what is bad, etc. We also philosophized (bushism term, deal with it) about evangelism, organizational growth, etc. Good conversation. He’s a really smart dude. I also was able to sit down with Larry Clarkin and Dave Bost with The Thirsty Developer. I had a good time on the podcast and hope it turns out okay for the guys. Thanks to them for asking me to participate! The Thirsty Developer is one podcast that I’m subscribed to and I think they have a good balance of fun and conversation with the people they choose to talk with. I would recommend you take a look and consider subscribing. 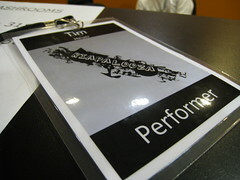 I was real pleased with RIApalooza and hope to see more of them sprout up. The mashup of community and discussion was welcome and refreshing. Congratulations to the entire planning committee on a job well done.